Seeds are not just for birds! They have amazing health benefits for us as well. 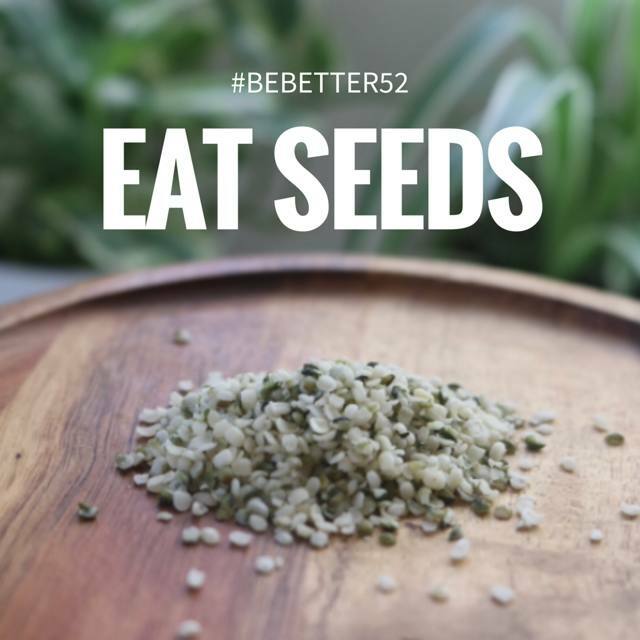 This week’s #bebetter52 challenge is to incorporate more seeds into your diet. Go to the store and buy a pack of seeds you rarely eat or have never tried and commit to eating them. You can find them at your local grocery store, often sold in bulk. What kind of seeds? You have plenty of options! From chia seeds to sunflower seeds to hemp seeds, sprucing up your diet with these small but powerful food sources will benefit your health. 1. Add them to a healthy smoothie. 2. Put them in your cereal or oatmeal. 3. Use them as toppings to salads. 4. Eat them by the handful or in a trail mix. What type of seeds are the healthiest? Our favorite resource for good information on "super seeds" is at www.self.com. It highlights many different types of seeds you can incorporate into your diet. They list 7 seeds that help in a variety of ways. For example, pomegranate seeds are good for weight loss, sesame seeds for a healthy heart and flax seeds for cancer prevention. Chia seeds are becoming increasingly popular in American culture for good reason. They are easy to digest and don’t need to be ground up. Chia seeds can help you reach your weight goal by decreasing your appetite and helping you feel full faster. They also provide hydration, a big perk for athletes. Chia seeds are rich in Omega-3, an essential fatty acid found in fish and certain plants. Another great seed is the flax seed. Also high in Omega-3, flax is additionally a great source of fiber. Include these seeds in your cereal or other breakfast foods for energy all day. Flax seeds can help reduce cholesterol, which creates a more heart-healthy you. A more commonly consumed seed is the sunflower seed. It is great in salads or just to snack on. Sunflower seeds are a natural vegetable protein, and we all know how good protein is for the body. Like flax and chia, sunflower seeds help lower blood pressure. Three other power seeds include: Sesame seeds, high in antioxidants and rich in protein, are also a source of zinc; Pumpkin seeds are a tasty source of iron, zinc, B vitamins, magnesium and protein with a high concentration of the amino acid tryptophan to help lower anxiety levels; Sacha inchi seeds are one of the best plant sources of omega-3, omega-6 and omega-9 fatty acids. Great nutrition often comes in small packages. Let us know how you use seeds this week and share your best ideas with others.